Read more about Nesprofits - What Else? US Beverage-Maker Mott's Celebrates Booming Sales and Share Price by Attacking Wages! Workers at juice and beverage manufacturer Mott's in Williamson, New York, members of the RWDSU-UFCW Local 220, are being asked to celebrate the company's highly successful sales and stock performance by agreeing to steep cuts in their wages and the elimination of their pension plan. Read more about US Beverage-Maker Mott's Celebrates Booming Sales and Share Price by Attacking Wages! Representatives of 13 unions at 10 Unilever India factories travelled across the country to meet in Assam on March 27-28 in an unprecedented show of solidarity with the embattled union at the company's Doom Dooma factory. After years of struggle, and only hours before scheduled industrial action, the Swedish Food Workers’ Union has broken a deadlock to win a new national collective agreement for the food sector which provides extensive protection against the use of temporary agency labour. The agreement will be in effect from April 1, 2010 through January 31, 2012. IUF Tells UN Precarious Work is Undermining Human Rights! The IUF has made an official submission to the United Nations' Special Representative on Business and Human Rights, Professor John Ruggie, drawing attention to the many ways in which precarious employment is being systematically used to undermine trade union organization and bargaining power. Read more about IUF Tells UN Precarious Work is Undermining Human Rights! Two hundred union members occupying the basement of the Pearl Continental Karachi Hotel ended their 25-day sit-in on Saturday night, March 20 when a direct representative of the hotel's owner directly intervened in the conflict for the first time ever in the more than 8-year history of the conflict. The IUF Global Dairy Conference held in Buenos Aires and Sunchales, Argentina March 9-12 brought together 120 union representatives from 22 countries to map a united trade union approach and action in response to the common problems facing dairy workers globally. Tension is building to a crisis point at the notorious Pearl Continental Hotel in Karachi, Pakistan, as 4 elected union leaders continue to resist their illegal dismissal on February 24 by refusing to leave the hotel and union members and supporters maintain a vigil outside. The right to food is grounded in key human rights instruments (declarations, conventions, covenants) which oblige governments not only to protect this fundamental right but also to actively ensure that the right to food is effectively realized. Domestic workers around the world are organizing to challenge the harsh, abusive, often slave-like conditions in which they work. 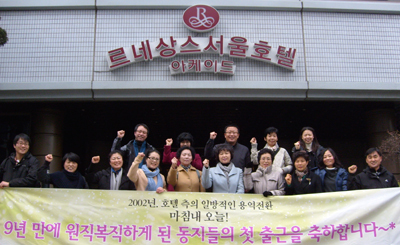 They are organizing unions and support networks, and they are mobilizing in support of an international Convention that will finally recognize them as workers and establish their rights in international law. An agreement between the Colombian rural workers union SINTRAINAGRO and Palo Alto Gnecco Espinosa Investments has brought a successful first round conclusion to a long, bitter struggle at the company's palm plantation in Ciénaga district, Magdelena. GAPWUZ, the agricultural and plantation workers union in Zimbabwe is again under attack. General secretary Gertrude Hambira is currently in hiding and at least one official under arrest. 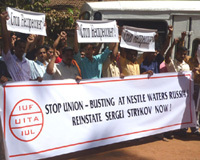 Nestlé Workers Worldwide Say: Stop Nespressure! Read more about Nestlé Workers Worldwide Say: Stop Nespressure!